Hey brother's Have any of you tried Hupharma yet? it would really help us out explaing you experience!! I Understand Youre a Rep,Please Advise Thanks! I've been running their gear for a couple of months now, all seems good. The Tren A doesn't seem to cause the night sweats I've had before. It's never been bad or anything to complain about, but their gear seems to have even less effect that way. I'm way down south Washington County area, but I have a branch of my company in Woods Cross, so I'm there often and I use the Bountiful airport when I fly in to make a visit, so I'm real familiar with that area. I like the airport there, I land in a lot of different airports and they all have their good and bad, Skypark is really nice because it's not too busy is plenty long enough and close to where I want to go. There's no landing or tie down fee and their fuel prices are better than most. I'm a contractor, we do a lot of UDOT work so I travel quite a bit to try and keep up with what's happening with my two operations; Southern and Northern Utah. Yes, I've been flying my own aircraft since 1987. I've owned many planes, right now I'm flying a B36TC Bonanza, it's a nice plane, fast and not too expensive to fly, I've had it about 5 years now. Things have changed a bit in what kind of flying I need to do, so I'm getting another plane next week. Most of my flight time is in pressurized piston twins and my favorite plane is the Aerostar 601P and that's what I'm getting next week. I'll take red eye to Florida where the plane is based, spend the week there inspecting and test flying it and getting any needed repairs done at the owners expense, then fly it back to Utah. Westbound there's usually a headwind so flight time will be close to 9-10 hours, that means three stops for fuel. It's going to be a long week! In case you want to know what these planes are here's some pictures. 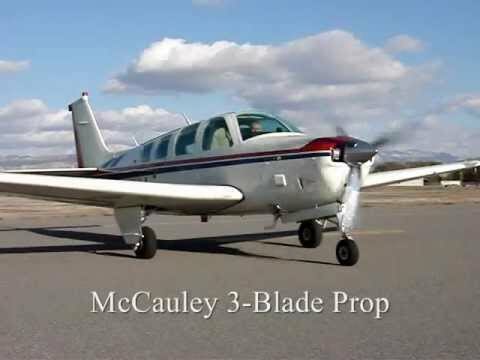 I think this is actually my plane before I bought it: It's the right color and has a polished prop and it's a for sale ad from the dealer I got it from. Since then the prop has been replaced and the engine overhauled. It's not the one I'm buying, I don't see any pics of it on the internet, but you get the idea and difference. I don't think so, I don't remember really, I've been flying since 1987 and the more I learn and know the more I realize that the main thing to fear is a bad pilot. Small planes have a bad rep because they crash more often than big ones do, but this fact has little to do with the size of the plane. It's the training, experience and judgement of the pilot that really matters. Planes are extremely reliable and must be inspected every year or at a minimum hours of flight time. Many parts are lift limited to time in use and some in calendar time, an air-frame or engine failure is very very rare. Running out of fuel and flying into bad weather or at night without the proper ratings and experience is how most accidents come to happen. Aviation is not inherently dangerous, it is however extremely unforgiving, if you fly, don't even think you're lucky or can beat the odds. Be careful and be safe and you'll be fine. Almost all general aviation crashes are from pilot error, pilots doing either stupid stuff or doing things they are not trained to do. You remember JFK jr and his crash? He had no business flying the plane in the time and weather he went flying in, be got spacial disoriented and did not know up from down and he flew the plane into the ocean doing about 250 mph. He was flying at night over the ocean and to top that off it was hazy. He had no experience or rating to fly a plane without being able to see the ground, even at night over land he would have had trouble. We normally perceive our surroundings and situation from two sources; our inner ear and what we see. If you take away the sight part and move, things get real confusing because your inner ear perceives accelerations which could be turning climbing or diving, but as soon as you stabilize the maneuver, what ever it is, turning, climbing, or diving the acceleration stops and your ear perceives you are in a stable or constant attitude (going straight) when in reality you could be turning or climbing or diving. In Kennedy's case, he started a shallow turn and dive and then thought he was flying straight and level and he flew the plane in that constant turning dive into the ocean. It's a very common thing it even has a name it's called the dead mans spiral because so many pilots and passengers have died doing that same thing. If a pilot wants to be able to fly in those conditions or any condition where you can't see the ground as a reference he needs to train for and get an Instrument Rating. It's a very difficult rating to earn and maintain, but it teaches you how to fly the plane in reference to only the aircraft instruments, you do not need to see the ground to fly safely. If a pilot has an Instrument rating and is current, you know he is a serious and good pilot and many times safer than one who never did earn the rating. JFK jr did not have an Instrument rating, he was a fairly new pilot, overconfident, that arrogance it killed him and two passengers. Arrogance and overconfidence has killed many pilots and passengers. Air-frame and engine failure a minuscule number.